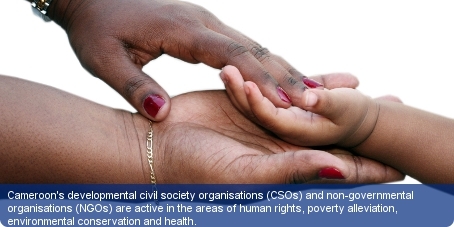 Cameroon’s developmental civil society organisations (CSOs) and non-governmental organisations (NGOs) are active in the areas of human rights, poverty alleviation, environmental conservation and health. Cameroon’s rich biodiversity attracts the involvement of many internationally funded environmental NGOs. The African Mangrove Network, Cameroon Environmental Watch, Living Earth Foundation and the World Parrot Trust all actively take part in a wide variety of conservation efforts. European bodies from the UK, Germany and France also operate in Cameroon. Human rights organisations include the National League for Human Rights, the Organization for Human Rights and Freedoms, and the Association of Women Against Violence and Conscience Africaine. Many of them hold seminars and workshops on various aspects of human rights and highlight human rights violations. NGOs/CSOs are registered by the Government of Cameroon under the Law on Freedom of Association (Law No. 90/053 of 19 December 1990) or/and the Law Relating to Co-operative Societies and Common Initiative Groups (Law No 92/006 of 14 August 1992). The trade unions in Cameroon are key in influencing commercial practices and aiding the nation’s workforce. Until 1995, the sole trade union in Cameroon was the National Union of Cameroon Workers (UNTC). Individual trade unions join together under the Federation of the Trade Unions of Cameroon in order to promote unity and attain common goals.